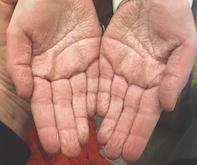 A 12-year-old girl presents with rapid and severe skin wrinkling that affects her palms after exposure to a small amount of water. 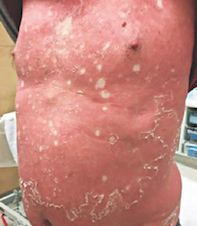 A 45-year-old man presents with an intensely pruritic rash. 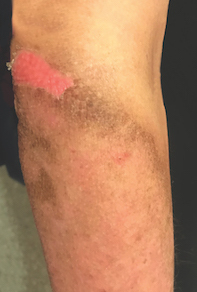 A 56-year-old man presents with a severe erythematous eruption with associated exfoliation. An elderly woman presents with a painful hand rash and isolated chest wall lesion. A 45-year-old man presents with a two-day history of progressive erythema and swelling affecting both hands. 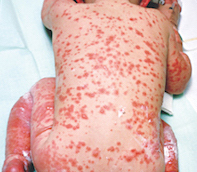 A 6-month-old boy presents with a vesicular rash. Figure 1. Hyperpigmentation of the patient's forearms with sparing of the skin under his watch. 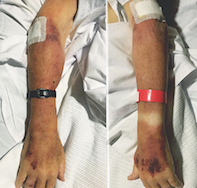 A 70-year-old man develops an erythematous, hot and itchy rash on his forearms while in hospital. 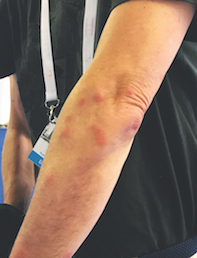 A 48-year-old woman presents with a photodistributed rash. Figure 1. The severe blistering eruption at the time of hospital admission (case patient). 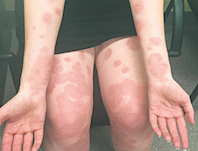 A young girl presents with a severe blistering rash that has developed over the past 24 hours.